Trailer 2: Nightmare on Elm St. I know there are plenty of people who are very skeptical of this remake, but from what I've seen Samuel Bayer's vision brings back memories of how the series started, scary! Jackie Earle Haley looks spot on as Freddy Krueger. 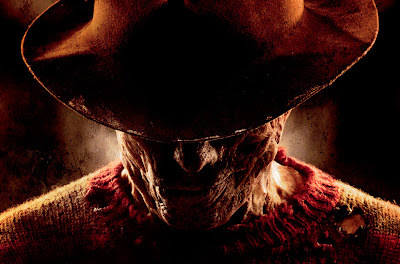 I like that the remake has given Freddy a bit of different look. I have heard many complaints about Jackie Earle Haley's voice and while it is not Robert Englund, Haley has a frightening tone that I can't to hear more of. My biggest reservations about the Platinum Dunes remake is the primarily unknown cast. Hopefully they can carry the film well enough in between Freddy's haunting. "A Nightmare on Elm Street" releases April 30th and is directed by Samuel Bayer. The remake stars Rooney Mara (Youth in Revolt), Kyle Gallner (Jennifer's Body), Katie Cassidy (Harper's Island and Melrose Place), Thomas Dekker (Terminator: The Sarah Connor Chronicles), Kellan Lutz (Twilight and New Moon) and of course Jackie Earle Haley as Freddy Krueger.